Last year we had released a series of reports on the alumni of the top B schools we cover, slicing aggregate data from LinkedIn by company, location and organizational function. When we released these reports, they created quite a stir. People were amazed by the new avenues for data exploration, and the insights opened up by a few mouse clicks on LinkedIn. As always, we begin the first report in this year’s series with a vote of thanks to Reid Hoffman and Co (founders of LinkedIn). It is a well-known secret that the Alumni effect is quite powerful in top recruiters – B school alumni (also referred to as ‘mafia’ or ‘The Mob’) wield significant influence over the hiring policy in top companies. The objective of these reports is to uncover the extent to which your B school’s mafia have infiltrated various companies, including your dream companies. 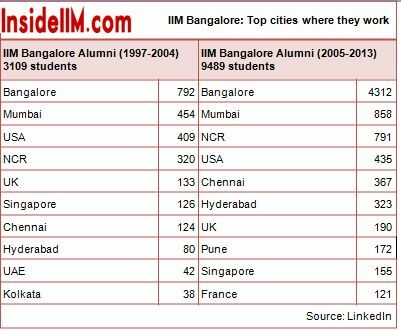 This information is pretty useful because alumni presence influences your chances of joining these companies, whether you are a prospective MBA candidate, an MBA student or an alumnus of any of these B schools. We hope you use these reports to understand the general trend, please don’t reply to us fuming about minor numerical discrepancies, seeking introduction to contacts etc. We have considered people who have mentioned the six older IIMs as part of their ‘Education’ between 1997 and 2013 on their LinkedIn profile as our universe. This report focuses on three aspects of this universe (top ten locations where they work, top 20 companies where they work and main organizational functions). 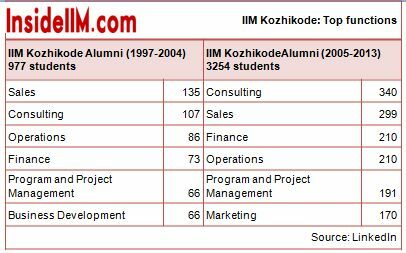 The time period for the study, 1997 to 2013 – includes 17 batches of the flagship program at these IIMs(14 and 15 in case of IIM I and IIM K). This period has been divided into two nearly equal parts – 1997-2004, and 2005-2013. No double counting: The data reflects the organization where the professionals are currently working and not the history of organizations where they have worked. For. e.g. if someone had worked at McKinsey till 2010, and is now working at BCG, that person will be counted only once, and be counted under BCG. This will reflect aggregate figures accurately, except in case of people who have forgotten to update their LinkedIn profiles. Fake profiles: Since data is user-generated and not verified independently, it cannot be 100% accurate. There may be a few fake profiles, but they are rendered insignificant due to the large sample size which means they will not distort the general trend. 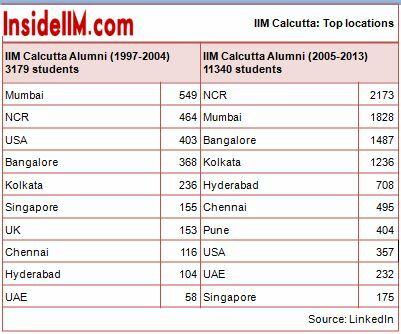 Other issues: The data includes all those who have attended a management programme at these institutes. Need not necessarily be the flagship PGP. Could also be the Executive MBA programme, or even the MDP at these IIMs. 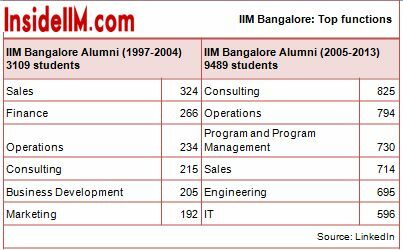 In 2005 IIM Bangalore started a PGD in Software Enterprise Management – to train professionals in the IT industry. IIM Calcutta also did something similar. More damningly, it could also include people who have done a three-day certificate course. How do we get rid of this error? We eliminate this by looking at a small bunch of dream companies in subsequent reports, where it is practically impossible to get in without doing a flagship MBA from a top B school. Not a job, just an internship: The data includes current PGP students doing their summer internships, for which the data has been reported as the company where they are doing the internship. It not difficult to see the trend in IIM Ahmedabad’s data – a generational shift from investment banking to strategy consulting. 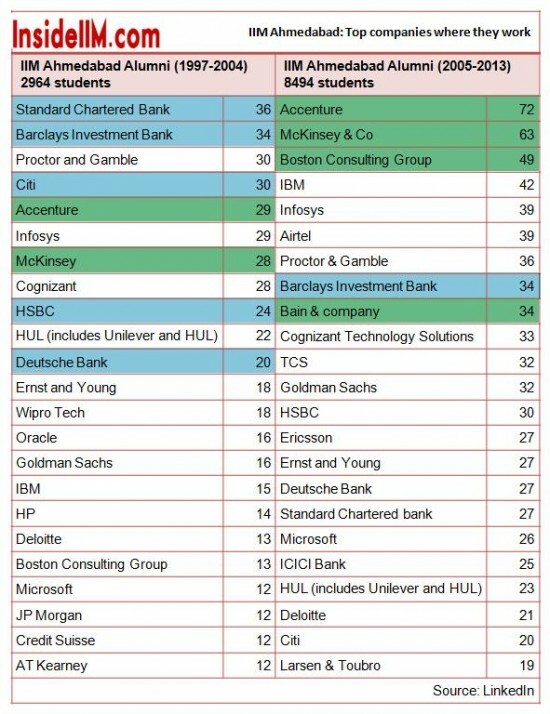 In the early 2000s, students used to flock to investment banks in droves. In the batches from 1997-2004, there are five banks in the top eleven companies. That has now changed, and for the later batches (2005-2013), we see that consulting is clearly top draw. The ramping up of BCG’s operations is clearly evident – only 13 graduates from the 1997-2004 batches, and now among the top three companies with IIM Ahmedabad alumni. Among functional areas, finance was top choice for the batches between 1997 and 2004; now it is sales, followed by consulting. 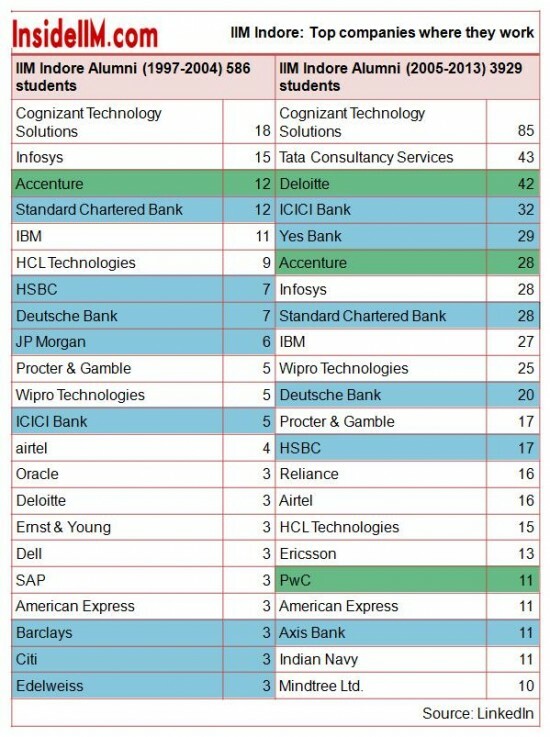 All banks and consults (and not just top-10) have been colour coded, because data is influenced by IT companies’ mgmt programs. 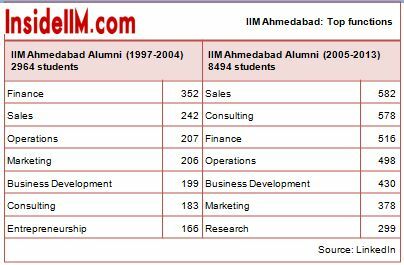 The analysis: IIM B started programs for IT industry professionals in 2005. This, and to a lesser extent Bangalore’s status as Silicon valley of India probably explains the preponderance of technology firms in this list. Again, the trend of shift from investment banking towards consulting is evident – from both, the companies list as well as the functional specialization data. Citi, Standard Chartered, Deutsche, HSBC etc, all have sizeable numbers from the 1997-2004 batches, they are not to be seen in the 2005-2013 data set. 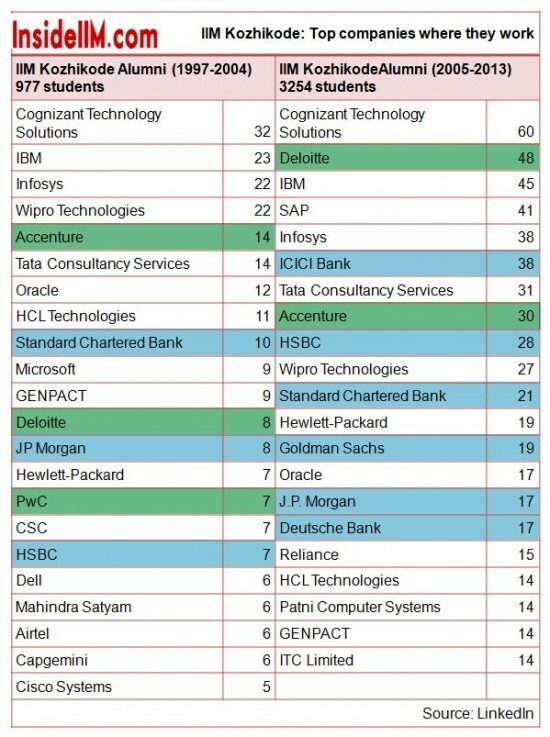 Goldman Sachs has 44 employees from the second set – more than half of them working out of Bangalore in what is most probably a middle-office role rather than a front end role. BCG is bottom of the list in the 1997-2004 data set, McKinsey is not even in the list. Both are found somewhere in the middle of the second data set. The second set also sees the emergence of some tech companies with a refreshingly higher ‘cool quotient’ than Indian IT players – Yahoo and Amazon. All banks and consults (and not just top-10) have been colour coded, because data is influenced by IT companies’ mgmt training programs. The analysis: Again, there is a predominance of IT service firms, mostly due to their running management training programs for their employees in conjunction with IIM C. The transition from investment banking to strategy consulting is evident, but less pronounced. 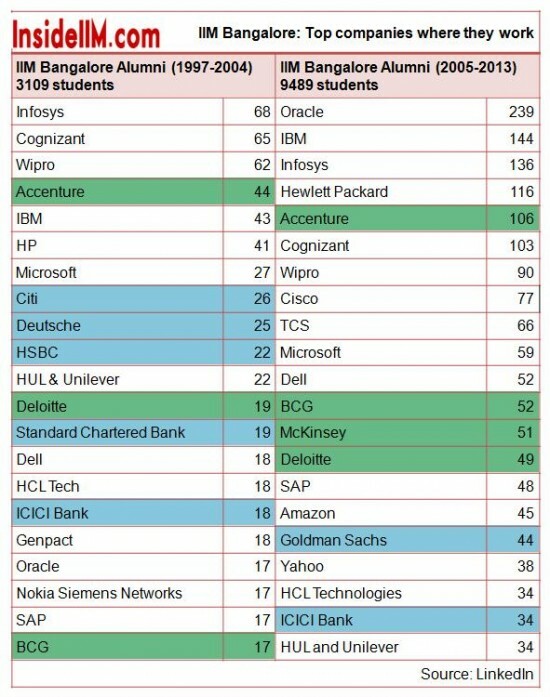 BCG, which seemed to have rapidly ramped up its hiring from IIM A and IIM B between 2005 and 2013, is missing from the second list at IIM C. Airtel and Microsoft have hired heavily from IIM C.
Analysis: Data is not as heavily influenced by non-flagship programs, as the earlier two IIMs. Again, we see evidence of a secular shift from finance to consulting. Not so visible among top recruiters, but clearly visible in aggregate data. Hiring has been weak among foreign investment banks for their front-end roles. Hiring is robust among two constituencies – Indian retail banks looking to expand, and foreign investment banks (mainly JP Morgan, Deutsche Bank and HSBC) looking to cut costs by outsourcing some of their supporting operations to India. Analysis: Consulting rules the roost at IIM K and IIM I, with the big names being Deloitte and Accenture. Bulk of the remaining professionals may be into IT consulting. Just like IIM I, banking has shown a strong presence at IIM K, for reasons already discussed. 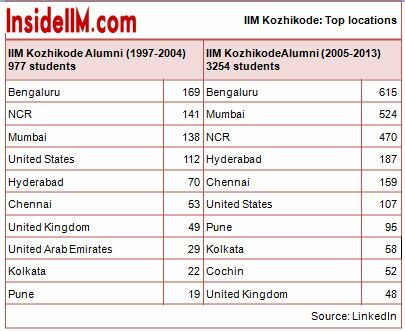 Locations: All IIMs, apart from IIM Bangalore and IIM K (the southern IIMs) have the largest alumni base of their senior alumni (1997-2004) in Mumbai. 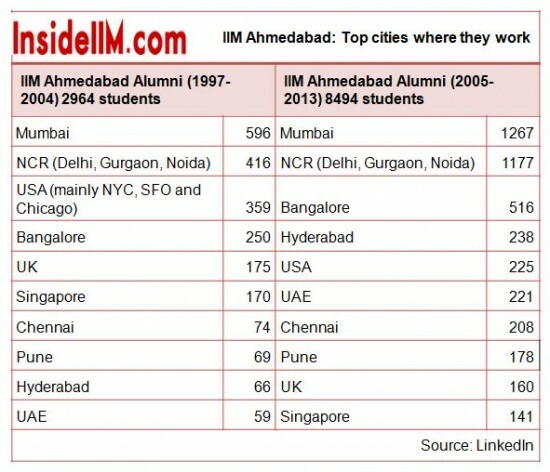 Among many IIMs, there is a generational shift towards NCR over Mumbai as the top job location. It could be that Mumbai is losing out on India’s best and brightest to New Delhi. On the other hand, it could also mean that NCR is where all the grunt work is done by new joinees, before they rise up the ranks and get promoted to a job posting in Mumbai. This report is only indicative, we will be releasing more slices of this data which you will find very useful. We promise there are more insights coming your way. Read last year’s report here, the entire series can be read here. Sad to see performance of IIMI. Hopefully the next 10 years are better for my alma-mater ! 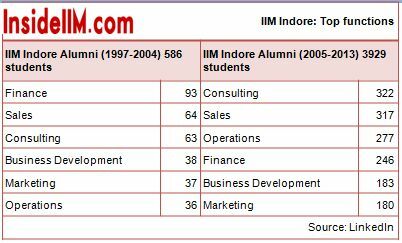 IIM Indore has/had (not sure if it still exists) a tie-up with the Indian Navy for providing an Executive MBA Degree to its officers. Don't think anyone did his/her PGP and joined the Indian Navy. It is true. IIM Indore also has a programme for Defence personnel. Army and Navy officer have done programmes at Indore. 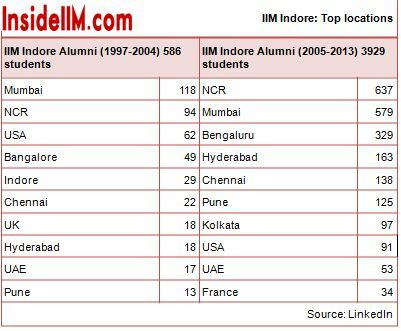 It is also driven by the fact that the Mhow Army cantonment is less than 10 kms away from the IIM Indore campus. It is unlikely that anyone from the PGP programme at any IIM has ever joined the Army after graduation. 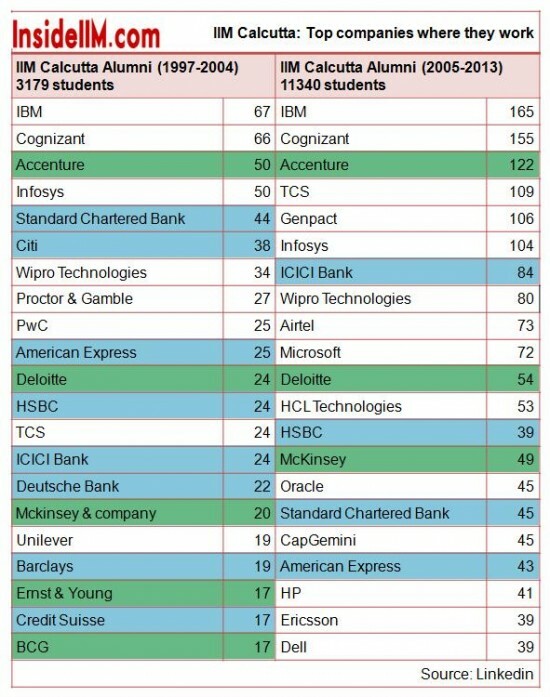 Overall, Accenture seems to be the top recruiter among the top 6 IIMs. Does Accenture include only Accenture Management Consulting(AMC) or Accenture Technology as well ? It includes all Accenture companies. Surprisingly, LinkedIn does not have a separate registry for each of the subsidiaries. 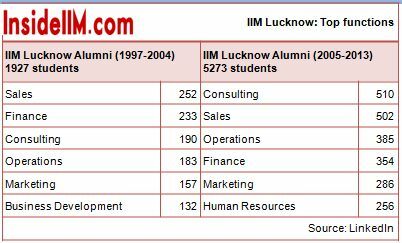 Also, as mentioned in the report take it with a pinch of salt as these numbers include all kind of programmes offered by an IIM. Even a 3 day certificate programme. It is not possible to get numbers at this stage only for the PGP or the EPGP programmes. 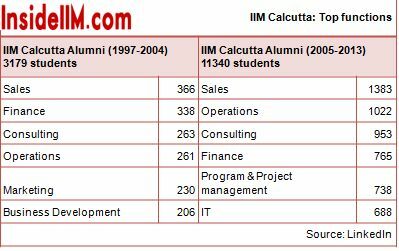 IIM C has 106 alumni in Genpact . Whoaaa ! Does it hire heavily from C? Or is it the PGP/PGPEX funda ? Genpact has quite a big operation in Kolkata hence the alumni strength.. 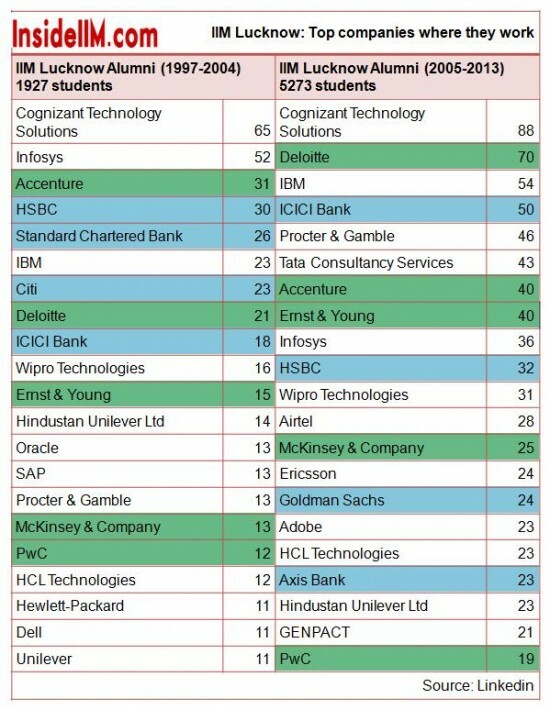 The analysis mostly says that the preference of students of top B-schools have moved from Finance to Consulting. I have a different opinion here….post the 2008 financial downturn, there are only few intakes in the I-banks and now they come to recruit only one-two people which forces the students to choose the next best option (in monetary terms) which is consulting. Given more opportunities in the finance sector, students even today would prefer to choose finance over consult. Interesting point you bring up. But I haven't really commented on students' innermost motivations – they are impossible to know. It's just that more people have joined consulting – this was initially driven by market forces. Over time, it is possible that students with the best profiles are ignoring finance and naturally gravitating towards consulting and general management – given that these jobs are well paying, and have significantly better quality of work than finance. Professionals in France mainly consist of students who visited India for an exchange programme and have mentioned their exchange school as a part of their education history. It is not people who have not changed their location. They are foreign students who have done a term at the IIMs. I request a similar analysis side to side on imt-g, mdi, nmims. Will beat many b-schools here hands down on all accounts across spectrum. MDI tak thik tha …what is IMT G and NMIMS ? do they rank even in Top 20 forget Top 10 ! 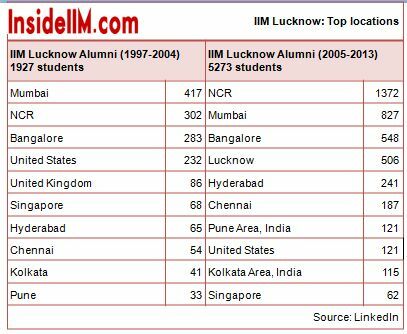 IIM-A blows every other college by a big mark. Amazing companies and alumni!! McKinsey, BCG, Barclays! XLRI figures are better even with much lower batch sizes. Guess taking 100% of your student on pure merit (it is only 50.5% for the IIMs) definitely has its advantages. Almost all of the merit category candidates at XLRI are ABC rejects. Not exactly!! Nowadays,most of the XLers are those who couldn't crack online version of CAT but successfully cracked XAT. And I guess as an aspirant you are smart enough to compare online avatar of CAT with XAT paper. Having said that, most of us will prefer ABC above XL. @ Well-wisher– "Almost all of the merit category candidates at XLRI are ABC rejects." Well, 100 percentilers are being directly rejected by IIMs by their stupid criteria even without allowing them to make a point during GD or PI.. So much for REJECTION CRITERIA !!! You need to be from the Right Board, Right Caste, Right Gender, Right Educational Background and most importantly appear for the CAT on the Right Date and Time to get into ABC.. That is proof enough that present ABC rejection criteria is VASTLY FLAWED !!! Well, I follow PaGalGuy.com. 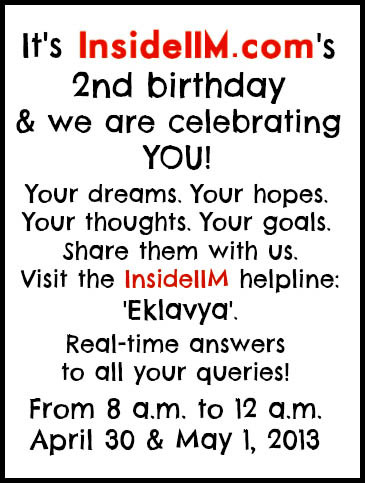 And I see that (most) PuYs from "Dream Team" and "Underdog Team" have made it to one of the top 3 IIMs atleast. They were not struck by any (ab)normalization. They performed well in the mock tests and did even better in the CAT. There were exceptions to it. Besides there has been no radical changes to the extent to which an XLRI waitlist moves post online CAT visavis the previous years. Many XLers do crack the CAT, just that they don't make the final cut at IIMs and hence they become XLers. Being a old PG member and a UDT member. I request you to kindly check results of past four five years since CAT went online. I can vouch for the fact that almost half of the junta couldn't get high percentile and if you look at their XAT percentiles, it will be 98+ for almost all of them. Nevertheless, it is way too small sample set to bias an opinion. You gotta be kidding me Gooner ….who would leave XL and goto the lower runf IIMs like IIM I , K or even FMS …i do agree if one gets IIM A B C , then they will take it over XL…half or a bit mor than that may even take L cos of good location of L….but others will goto XL. 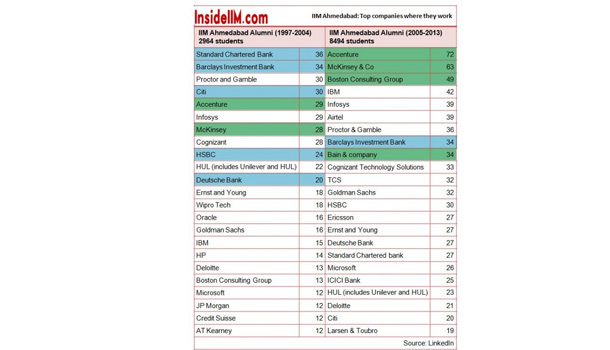 …IIMs below ABC and L dont even come close to XL…. The effects of reservation do not manifest until maybe a few years….But the apparent downfall in quality is there for all to see….If you have 60-90 percentilers studying alongside 99.5 percentilers, the hallowed brick walls of ABC, the media hype, the One-in-a-million 1 Crore salary, the Degree, will not and cannot change the individual's thought process, analytical skills and thinking capacity….I have seen umpteen cases where one would genuinely get shocked interacting with certain types of ABC grads…Its shocking to think that many more genuinely talented folks lost out becoz of this system!!!! Is XL Better than ABC….NO WAY!!!! Does that mean that the quality of all the folks at ABC is better than all the folks at XL…..NO F! @#$ING WAY!!!!!!!!!!! I see lot of students in IIMs who cracked ABC but couldn't crack XL and vice versa. Your point is logically flawed. It is not like JEE which gets filled uniformly as per a COMMON RANK. I also wish if InsideIIM could release the statistics cluster wise. It makes no sense to put I and K along with ABCL. It makes them look even inferior. Instead, you could club say ABCL, ISB and XL and show their statistics together. The others could be clubbed together and that would be more relevant. Plz Plz help me out with your advice as I really really need it urgently. This year, I was fortunate enough to convert XL, FMS & K till now. I have paid the installment of XL only. Now studying in ABC has been my dream for a long long time, so I was confused about whether to try again next year & aim for ABC one last time. But plz let me know if it is a wise decision to drop A YEAR & a brand like XLRI for the Holy Trinity? 😮 I work in TCS & am having 12 months work-ex till now. I am just very very confused about letting a college like XLRI slip past on account of my ambition. Is XLRI too much of a step-down when to the Holy Trinity? 😮 Plz reply. If u have converted XL BM , my advice would be to go for it rather that waiting for ABC..with CAT being a lottery and criterias changing every year u dont know what will happen …. ^^ ignorance is bliss. FYI Infy, TCS, Wipro have a separate profile which is offered at IITs. Why general management like Tata Administrative Services hasn’t been considered? I am sure that will figure in the top 10 recruiters. It has been considered. However, TAS is not a company.